Measured in degrees of stupidity, few can match my resolve. “I will continue to use my old phone until I win a new mobile from a blogging contest.” Unfortunately, this was a public declaration made in the presence of family and friends. In my biased mind, I was fairly certain of winning one. Many are doing it, I can do it too! This illuminating streak of stubbornness has its roots in my being a true Leo. Maybe Salman’s infamous commitment dialogue played some role. I am not sure, but what I do know is that once the commitment was made, it was impossible to give up. So far so good. I jumped at every contest which fired my imagination and offered a smartphone as a prize. Holiday destinations, tablets, Reebok vouchers were nowhere on my radar. The target was a sleek smartphone. I even dreamt of the courier guy delivering the prize, clicking a smug picture with my prized phone, uploading it on Facebook and viewing more than hundred envious likes. Well, nothing of the sort happened. Why I wonder, why am I not able to pen that perfect post, which can win the hearts of sponsors and judges alike? The self-esteem was bruised. The confidence punctured. Serious doubts about all the effusive endorsements dressed in hyperbole, ‘Keep writing’, ‘Good one’ ‘Enjoyed it’, began plaguing the mind. At a time when the country is going to hell, my obscure rant may appear inappropriate. Not really! Consider the fact that some are amassing crores simply by lifting their lungis, winning a writing contest is indeed a small pleasure. And isn’t life all about small pleasures? Unable to watch my glum face, the husband suggested a novel idea. “Why don’t you ask our son to send his old HTC? You can uphold your resolve and yet upgrade to a better phone.” Hope flickered. But as luck would have it, sonny dear somehow managed to drench his HTC bought a year ago. The funny thing is that whenever he wants a new gadget, he manages to eliminate his present one in mysterious ways. Now I am stuck between my resolve, and my old phone which has become quite an embarrassment. The Kindles, the Flipboards and the WhatsApps are adding to my misery. ‘Read on your Kindle’, ‘Come on WhatsApp?’ ‘Click our picture’ say friends. For all those who regularly rub lemon on my poignant cuts, here is a declaration. 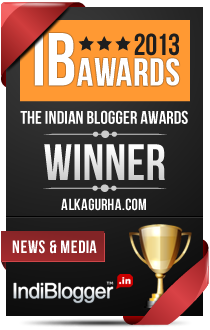 the award for being the best blog in the ‘News and Media’ category. Phone be damned, time to rejoice and thank all my readers who visit this blog. This is my 'Miss India' moment, albeit two decades late - complete with the cupping of the face and popping of the eyes. So a big thank you for spending your valuable time here. Finally, the resolve was about not buying a new phone. As far as I remember, there is nothing against buying a tablet or an Ipad. Ha ha. No whining for six months. After that its back to normal. Good on you, Alka! I can't think of anyone better in News and Media category with your incisive posts on politics. About the smarphone problem, let the husband buy you a phone,that way you are not buying one yourself :). It is because readers like yourself spend time here. Thank you for being a part of my journey. I have learnt a lot from you Rachna. Got my iPad Vinita, thanks for the wishes. True, thank you for being there in spirit and in words. Hope to meet you some day. Many congratulations Alka! This is truly the WIN - sponsored contests apply other criteria than just the writing. So, go ahead and get a Tab or whatever. Got my iPad Suresh. The phone can wait. Waiting for the results of Colgate Moral of the Story contest. 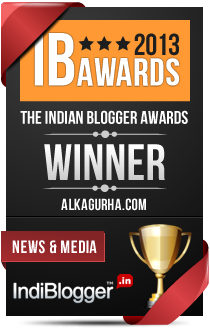 Congratulations Alka...i loved this post...going to be a regular now. Thank you Indu, that's very sweet of you. Congratulations.. !!! You definately deserve a new something like an iPad or tablet.. !! Wishing you many more such awards in future..!! My old phone is good for calling and messaging. And waiting for the results of Colgate Moral Of the Story contest. Thanks doc. Some of your latest posts are winners. Btw, I really liked the one you wrote for Ambipur. I am actually fearing for those days where my current mobile cracks up and then I will never see another such simplistic mobile in markets and then have to buy those iphones which is completely useless for me and waste of money. Great minds think alike. High Five Bhavana. Alka! I am disappointed! You forgot to talk about world peace and your admiration for Mother Teressa. P.S This memorable win demands that you stop torturing yourself with an antique phone. Go splurge! Ha ha. Yes, it is indeed a happy moment, more so because of all the good wishes. Ah! those contest nightmares, Alka. I do stand by you on that :) Congrats on winning the IBA. Thanks,it was quite melodramatic, but I was alone so no one captured it on camera. Wow! congrats for the award Alka. Let the news flow in humorous way! Thanks you for the kind wishes. Ha ha thanks Shilpa. Waiting for the Moral of the Story contest results. As for waiting to win a phone in a contest, you can anyday treat yourself to a new phone irrespective of the results as your posts are always winner-material. The IB Award is just a small example. Being a doctor, you need a smartphone. And thank you for stopping by. Means a lot. Congratulations on ur winning Alka! This one has ended extremely well! Congratulations, Alka! It has restored my belief in God. Well said. Congratulations to you too. Well, in another news, 'Lighthouse insights' our (hubby and me) social media blog has won in the SM category!!!! Thank you Vinaya. I stay away from Twitter but I did get your message. Congratulations to you too. Only yesterday I was looking for an article on media and I came across your article in lighthouse insights on ten best campaigns on social media. Very informative and very pro. That's very kind of you Ranveer, thanks. Means a lot. If I remember, you were here earlier too. wow Alka..this is sooo neat !! as a blogger nothing is more amazing than being recognized or being appreciated for your writing !! congrats again ..
Oh yes, after Salman, I have SRK for inspiration. I am not giving up. Yet.